We are happy, proud and thankful, that our work got featured in Design Detail magazine. So we thought of retelling the design story they had beautifully narrated in the magazine, here in our blog. Toscano is a premium Italian wine bar, restaurant, pizzeria brand. RCA had successfully designed five Toscano restaurants across Bangalore. Design Detail had done their research on all these locations to arrive at their learnings. Although there are many branches for Toscano across Bangalore city, they are designed keeping a common theme at the core. But each of them has a custom plan depending upon the space and structure. The common theme is crucial to be maintained for all branches. The colour palette chosen for this chain of restaurants is one of the highlights of the design. The design aims to create a sense of sophistication and yet bring a sense of calmness in the spaces. The decor is a mix of fine dining and casual dining, making it a very welcoming yet elegant space. Dark floors and dark colour tones are accentuated with a lot of openness. The design successfully creates the ambience of a quaint French Bistro. Irrespective of its location, the design outshines everything creating uniformity in all the outlets. Warm earthy tones make the spaces more intimate and inviting. The grillwork is yet another common feature uniting all the units of this restaurant chain. The green woodwork is one of the key features of the design. “Apart from their signature, lip-smacking dishes, they are known for their very sophisticated yet friendly decor, making it an easy option for food lovers.” – says DD. It’s overwhelming news for us to hear. But what’s the (social) proof? The social proof can be attributed to the emotions people acquire when they share a story to their friends and family. More they share their happy stories, stronger the belief that they love being part of the story. We did some check on Facebook to understand how happy Toscano customers are, being there. Looks like a lot happy!! In Bangalore, where restaurants compete fiercely for business, the decor of Toscano has clearly complemented the brand and the service they offer to its advantage. 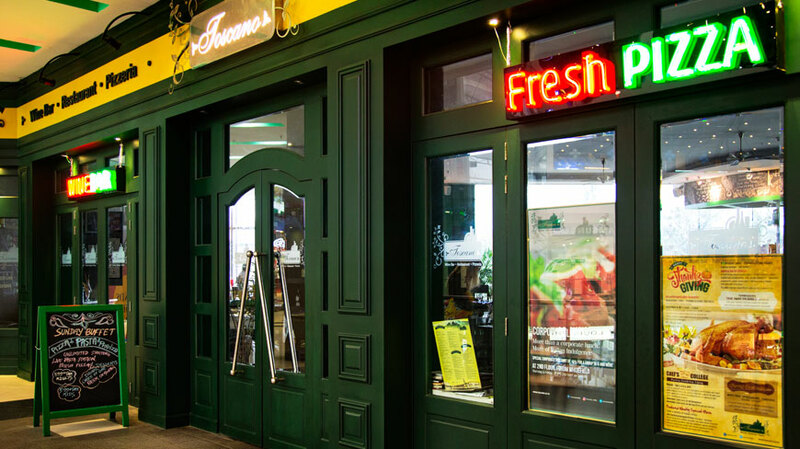 Toscano is able to mark memorable experiences in minds of its customers. We believe that we had done justice to the client brief that was to be expressive, uncomplicated and honest.